It’s that time again. Time to get as fashionably hip as possible… starting this weekend. And then some. Why? It’s a week long of non-stop events to satiate your appetite for high style with Austin Fashion Week, founder Matt Swinney's brainchild. After a week of a ton of runway shows, fashion parties and presentations, including the showcase events at local retailers, salons and spas and the Runways & Marketplace gathering at La Zona Rosa, Austin Fashion Week will culminate with the ultra glam Austin Fashion Awards on Saturday, May 11th at the Austin Music Hall. The show will again be hosted by Sandy of the JB and Sandy Morning Show on Mix 94.7. Why attend? That’s simple. The evening will share complete collections from designers like Austin’s own Gail Chovan for Blackmail, Stephen Moser, Kendra Scott, and Dawn Younger-Smith for Boudoir Queen along with looks by local Mash-Up Teams who will walk the custom runway. Hair by Jackson Ruiz and make up by Mandy Hernandez complete the looks of course. In addition to the shows, the prized Golden Boot Award, presented to this year’s Rising Stars, Trailblazers, and Mash-Up Teams. We have an inside track on who they are (see image) - it looks like our very own Lance Avery Morgan is receiving a Trailblazer Award, as a matter of fact. Following the awards presentations, all guests are invited to the After Party! 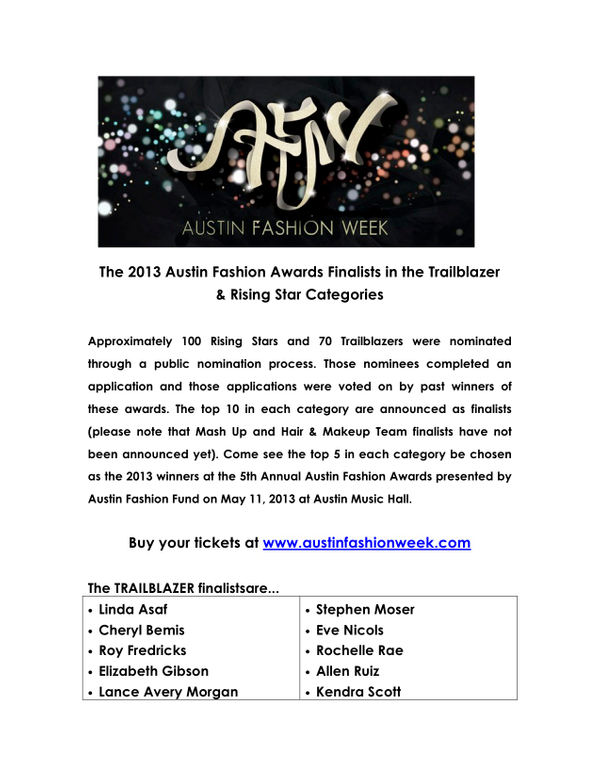 with other fashionable Austinites, and check also, to out the 2013 Awards Marketplace honed by Standard Magazine. VIP ticket holders will have access to the VIP Lounge presented by Luna. Do also check out the fun this Saturday, May 4th, the 5th Annual Austin Fashion Week opens its festivities with Noir, a chic fashion and feast event at Brazos Hall. Beginning with Taste, Chefs Shawn Cirkiel and Steven Cak of Austin’s Olive & June, Parkside and The Backspace will present a three-course seated dinner and guests will dress in all-black attire while the Blanc Runway Show will feature all-white looks by local and national designers and labels including Ross Bennett, Gail Chovan for Blackmail, Jessica Ciarla, Sarah Eileen, Stephen Moser, Sarah Parrott,Amber Perley (NBC Fashion Star Season 2 Designer), Rare Trends, Kendra Scott, Megan Summerville, a boudoir look presented by Teddies for Bettys, and Tess Designs. After, the runway pieces will be exclusively available for purchase at the Blanc Boutique with all proceeds benefitting The Arc of the Capital Area. We love that Austin Fashion Week continues to give back. At 9:00 PM that night, partygoers convene to the rooftop of Brazos Hall for Encore, the official after party. Austin Fashion Week will hold an avant-garde hair and makeup competition during the after party where teams will create a contemporary French inspired look and guests will vote for a winner that will be announced at the Austin Fashion Awards. The ultimate style mash-up.